 INDIANAPOLIS (March 4, 2019) – Atlanta, Atlantic City, Chicago, and Reno were home to Alpha Kappa Psi’s flagship event, Principled Business Leadership Institute (PBLI) February 8 – 10 and February 15 – 17. Find pictures from all PBLI events here. The date was February 8, 1949. Three new chapters had been installed the year prior, but 24 charters were pending approval from their respective universities. 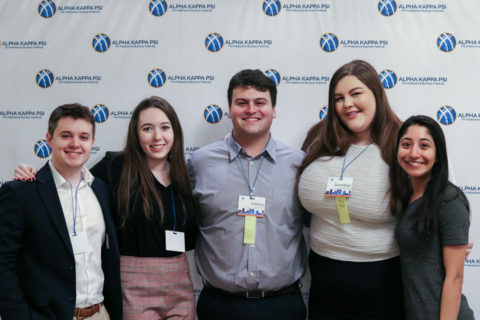 The concerns of Alpha Kappa Psi leadership grew each day that passed without a resolution from the universities where the futures of hundreds of potential principled business leaders were held in limbo. A decision needed to be made, and according to then Grand President R.A. Hills, it needed to be made quickly. 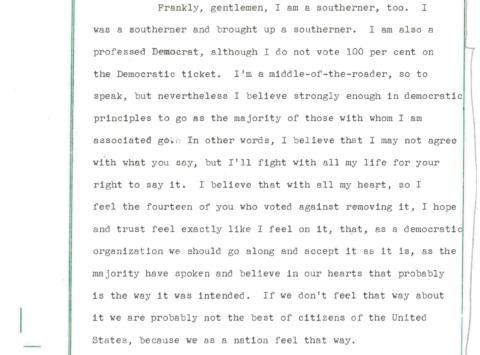 Mail Ballot, Past Grand President R.A. Hills. To view the text of this image, click here. The Fraternity Board of Directors received a Grand Council Mail Ballot from then Executive Director J.D. 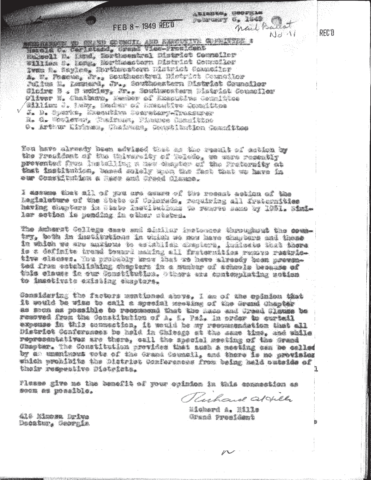 Sparks requesting a vote on whether to hold Grand Chapter (now called Chapter Congress) ahead of the Grand Chapter meeting already scheduled for 1950 to consider the race and creed clause. After weeks of deliberation by mail, the board of directors rejected the special Grand Chapter meeting proposal, claiming that moving hastily in a time of uncertainty was unwise. However, other Greek organizations also had a restrictive race and creed clause in their constitutions around this time and had made changes to the language in their governing documents as well. One Greek organization referenced in the minutes admitted only individuals who were “men socially and professionally acceptable,” per their edited constitution. 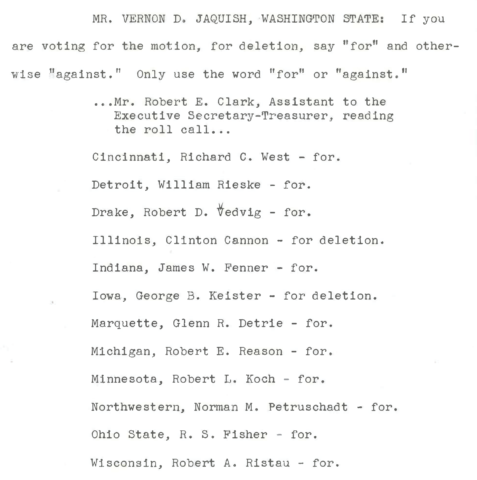 As a result of the board’s deliberation, the decision was made to include the vote in the 1950 National Convention Grand Chapter Meeting in Minneapolis, MN. The morning was warm on September 8, 1950, in Minneapolis. One by one, the delegates approached the threshold of the meeting room, only allowed to take a seat after announcing themselves. At the time, each chapter of the Fraternity was allowed one delegate at the Grand Chapter Meeting. During Grand Chapter, delegates voted on legislation to amend the Constitution of Alpha Kappa Psi. The Committee on Membership Requirements voted 11 to 2 to recommend that the restrictive race and creed clause be deleted from the Alpha Kappa Psi Constitution. The majority report was written by members of the committee who supported removing the clause completely from the Constitution while the minority report was written by those who also supported removing the clause from the Constitution, but subsequently, suggested it be added to the ritual manual. Brother James P. Lucas of the Omicron chapter at Montana presented the majority report. With eight points of support, the recommendation was later accepted by the Grand Chapter to be voted on. In the years leading up to 1950, 20 existing collegiate chapters were in jeopardy of losing privileges awarded to student organizations or becoming inactive on their respective college campuses due to the presence of the restrictive race and creed clause in the Constitution. In addition, 24 colonies in pursuit of an official Alpha Kappa Psi charter were put on hold or rejected completely because of the “announced undesirability of the restrictive clause,” as Brother Lucas noted in his recitation of the majority report. Integrity, a core value of Alpha Kappa Psi since its founding in 1904, emerged as the overarching theme to the vote. Of the two options provided for removing the restrictive clause from the constitution, one would prove to be deceptive while the other would require the organization as a whole to stand with integrity in support of all men, even those cast out by many people within the United States. During discussion of the majority and minority reports, a brother from Miami University stated that the restrictive clause showed a lack of confidence in a chapter’s ability to admit new members. Because members must vote on each pledge that requests admittance into the chapter, the restrictive clause proved redundant. Proponents also argued that having the clause “hidden” would be dishonest and sneaky, ultimately putting into question the integrity of a person, a chapter, and the Fraternity. Opponents suggested that removing the clause would prohibit the high standards of Alpha Kappa Psi and would extend membership to those who would not be accepted by all people of the country. Of the 81 delegates present, 61 votes were required to pass the motion for removal of the clause. The motion passed 66 to 14. One delegate was not in the room during the vote. 2019 marks the 69th year of the vote allowing people of color and people of any or no religious background to shape the Fraternity’s membership. Diversity is more than a buzzword in Alpha Kappa Psi. Diversity is a value we choose to foster every day. Expanding our knowledge on a subject we are unfamiliar with allows us to enrich the membership experience. Our organization is the sum of its parts – each area, region, section, chapter, and member molds us into who we are. Is there a history of diversity in your chapter you could learn more about? How is your chapter celebrating diversity and choosing to participate in the conversation? Join the discussion. 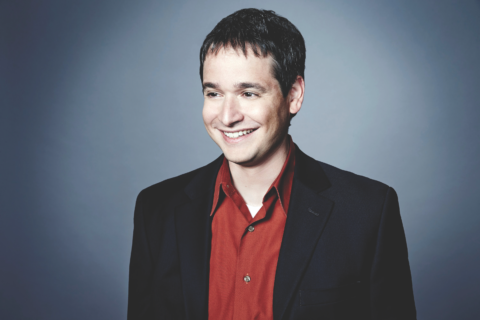 Joshua Silverboard, Florida ‘98, will begin the second day of the 2019 Principled Business Leadership Institute February 15-17 with a keynote address in Atlanta. Former Executive Director Frank Brye with Former CEO Gary Epperson. Brye was recognized with a certificate honoring his 50 years of membership in Alpha Kappa Psi. He served as executive director from 1971 – 1991. 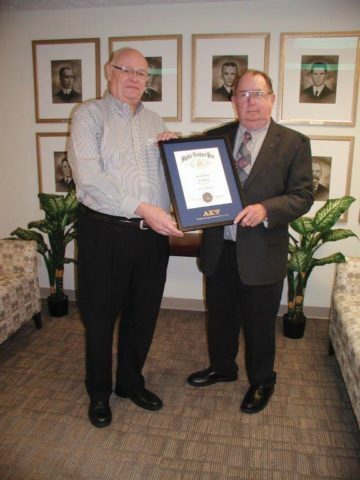 Sadly, we add Frank J. Brye, Gamma Tau ’60 – Life, former Executive Director of Alpha Kappa Psi, to the audit eternal. For more than 50 years, Frank contributed service and leadership to the Fraternity. In the world of business, there are few personal characteristics more important than strong and effective leadership. While managers may like to believe they’re all set in that department, statistics have shown that employees may not be so confident. 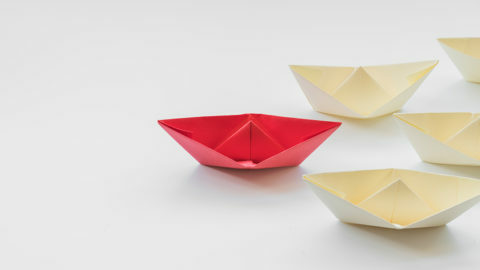 According to a study performed by Brandon Hall’s State of Leadership, though the most resources are dedicated to leadership development, 71 percent of companies do not feel their leaders are able or capable of leading them into the future. With this insight in mind, it’s no surprise industries are looking for a new approach to leadership. Many organizations have found success by turning to the concept of servant leadership. This concept places emphasis on serving individuals, as opposed to seeking out business goals or benchmarks. But how does this process work, and what applications might it have at work, with friends, or family? Though the definition is generally ambiguous, many thought leaders have gone on to provide their take on what exactly makes up the servant leader. Larry Spear, who served as president of the Greenleaf Center for Servant Leadership, outlined ten significant characteristics for these types of considerate and selfless leaders. Let’s take a look to see what these characteristics look like and how they apply to work, friends, and family.